On December 6, Landmark Events Historian Bill Potter and I will appear in Federal Court in New Orleans to answer charges of “illegal guiding” in a National Park. Two months after hosting a tour at Chalmette Battlefield in New Orleans, a certified letter arrived notifying us of our alleged crime, complete with return addressed envelope to remit the penalty for such an offense. After prayer and wise counsel, we are determined to contest the case as a matter of principle, standing up for our right to speak the truth on public lands. There is a noticeable shift taking place within the National Park Service from helpful civil servants, as many staff still are, to heavy handed gatekeepers emboldened with power and governed by political correctness. As you are probably aware, Landmark Events seeks to teach history from a biblical, “providential” perspective — a Christian worldview lens. 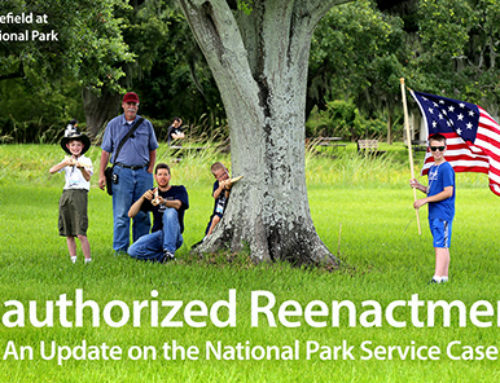 In the three years we have been in operation, we have increasingly encountered resistance to our historians guiding tours at national battlefield parks like Ft. Sumter in Charleston, SC., Bunker Hill in Boston, and now Chalmette Plantation in New Orleans. On one occasion, after declining to send our children on a “special kids’ tour” we were told with the scorn of the anointed, that “we know what your children need to know.” The implication of course is that we do not have that rarified knowledge. On June 24, President Obama recognized the Stonewall National Monument as the country’s first monument to honor the history of the LGBTQ community in America. On October 23, the Director of the National Park Service, Jonathan Jarvis, appointed by President Obama in 2009, and responsible for the new values of the Park Service, joined Interior Secretary Sally Jewel on a conference call to discuss the National Park Service release of LGBTQ America: A Theme Study of Lesbian, Gay, Bisexual, Transgender, and Queer History. . . Jarvis said they have identified 1,300 LGBTQ landmarks for consideration for historic designation. We need your help, both in prayer and financially. Pray that we would be wise like the apostle Paul during his trial, asserting his rights forcefully, yet always for God’s glory and not personal gain. If the truth is important to you, and having your children know the truth, then we ask that you prayerfully consider supporting the work of Landmark Events and particularly our current battle for your right to hear what God has done on the sites where they occurred. A new line has been drawn for how American history should be remembered and taught. We need to take our stand now, before, once again, the American people find the story of their country revised and the resistance silenced.